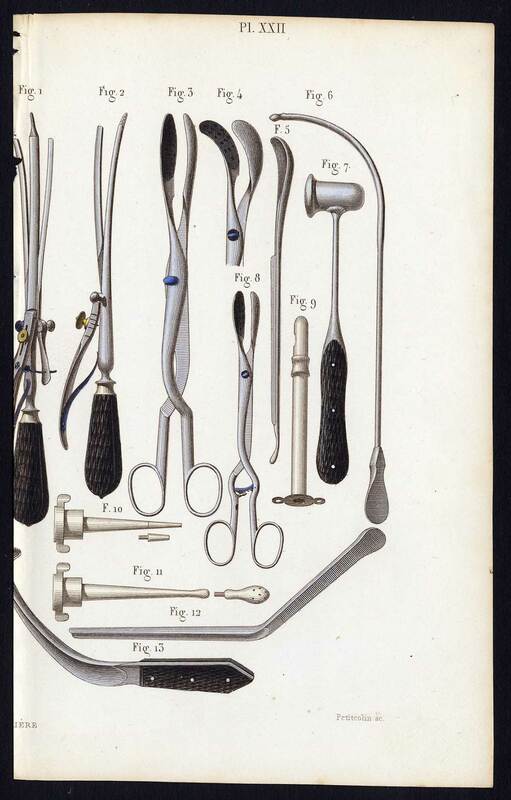 Subject: Plate XXII: This plate shows surgical instruments for lithotripsy and other operations on the abdomen; cannula, lithotome, stone hammer etc. Copy of descriptive text available. Condition: Good. General age-related toning. Margin's partially cut short. Please study scan carefully. Medium: Engraving / stipple engraving on a vellin type paper with original hand colouring. Size (in cm): The overall size is ca. 10 x 16.5 cm. The image size is ca. 8 x 15 cm. Size (in inch): The overall size is ca. 3.9 x 6.5 inch. The image size is ca. 3.1 x 5.9 inch. Description: This original antique print originates from 'Precis iconographique de medecine operatoire et d'anatomie chirurgicale.' by Claude Bernard and Charles Huette, published by Mequignon-Marvis, Paris 1846. Artists and Engravers: Claude Bernard (1813 - 1878) was a French physiologist. Historian Bernard Cohen of Harvard University called Bernard 'one of the greatest of all men of science'. Among many other accomplishments, he was one of the first to suggest the use of blind experiments to ensure the objectivity of scientific observations. M. Davesne, French engraver.